Voiced by Mark Holcomb, his signature Alpha & Omega pickups are now available once again due to popular demand! 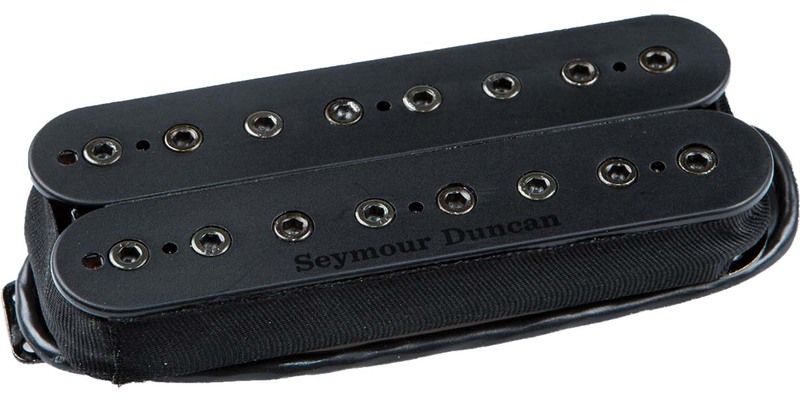 Previously available only through the Seymour Duncan Custom Shop, these pickups are now available to everyone. This model of the Alpha Neck Pickup is designed specifically for 8-string guitars. Working with guitarist Mark Holcomb, the Alpha neck pickup is unlike most traditional neck models. It was voiced to combine the best qualities of a neck and a bridge pickup, with some of that fat glassy sound but also plenty of your pick attack and fretting-hand phrasing. The Mark Holcomb Signature Alpha & Omega Pickups are made in the Seymour Duncan facility in Santa Barbara, California. "The Alpha/Omega set has been the heartbeat of my sound for the past several years. Since we developed and released the first 6-string set in the custom shop, I’ve had the same pickup set in every one of my 6, 7 and 8-string guitars, live and in the studio. It has remained one of the few components of my rig and setup that I haven’t even thought about tweaking." Dimensions: 3.565" x 1.384" x 0.762"